Nikki Baird wrote in Retailwire this week that almost every shopping behavior is being shortened by mobile technology. The behavior that most immediately comes to mind is showrooming. Buying a new TV used to mean driving to Circuit City, Best Buy, Sears and the local shops to compare prices during an afternoon. Now the same exercise (with different retailers) takes minutes. There are other areas where mobile is faster, cheaper, and better. For most retailers, it’s about better service. But to monetize the moments, most insert promotions or transaction opportunities. Indoor Mapping. The last year has seen a shift in retailers from being slightly aware to acutely aware of wayfinding, according to Patrick Connolly, senior analyst at ABI Research in London. He notes that Walgreens has already mapped 7000 to 8000 stores and connected inventory data with in-store location. This is a natural fit with shopping lists. And it’s a small step further to move to departmental location technology that identifies that you’re in the drink aisle and serves related offers. Scanning. Walmart’s Scan & Go iPhone app serves as a good example. Shoppers scan product barcodes in-store and add to their carts. At check out, the app displays a QR code that the customer scans on a self-checkout screen to wirelessly transfer the list of scanned items into the register at the point-of-sale and pay. Mobile payments and wallets. Once viewed as the killer mobile app, this behavior is slow to gain traction. Mobile transaction solve retailer needs such as easier transactions (swiping a card on a mobile device), analytics on shopper behavior, and lower interchange fees. But they don’t solve shopper needs because they are not more convenient than a credit card. This puts retailers in the position of “buying” behavior such as providing discounts. Once they do, they have a channel to reach shoppers in the moment. E-receipts. They’re convenient for shoppers and good for the environment. They also are a gold mine for retailers. E-receipt opt-ins build a retailer’s database of email addresses of recent active shoppers. They also create a new medium where direct-response ads can be served and customers can instantly redeem coupons. Many e-receipts allow shoppers to socially “share” their purchase. E-receipts from Square for iOS go a bit further, prompting shoppers to buy gift cards. 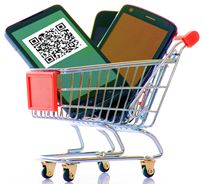 Shoppers and retailers occasionally are at odds over mobile technology. Shoppers see that mobile shortens the time and distance of shopping. Retailers fear showrooming and price transparency will squeeze their margins. But viewing mobile as an opportunity for retailers to serve first, promote second is a win-win for both sellers and buyers. Sam–Thanks for the post. Walmart’s Scan & Go is a great example of how a service application can become a marketing channel.